On Sunday 1 February 2015, Sr Martina Teresa of Our Lady Queen of Peace made her Solemn Profession at the Poor Clare Monastery in Arkley, Barnet. The ceremony took place during Mass, celebrated by Cardinal Vincent and in the presence of her community, family and friends. In the following piece, Sr Martina writes about her journey that led her to discern a vocation to the contemplative religious life as a Poor Clare. The inspiration to become a Sister came to me very suddenly when I was going through a short time of inner darkness. Gradually it developed into a light deep within me. I entered the congregation of the Franciscan Sisters of the Immaculate Conception in Scotland on 19 March 1991. In September 1993 I took simple vows and was transferred to a parish in Dublin, where I remained for seven years as a parish sister. This was a blessed and privileged time, sharing in the joys and sorrows of the people and making some wonderful friendships. However, during this time, I felt a pull to a more contemplative way of living. In November 2000, I was transferred to work in Kenya. I was truly blessed to have great support from my family, friends, neighbours and all the friends I had made in Dublin. Working with the people of Kenya was a blessing and a very humbling experience; but, even so, something was not completely at peace within me. In October 2009 I was asked to help out temporarily in the Scots College in Rome, where our congregation had just opened a new convent. It was a total change of work, but I adjusted to it very quickly and enjoyed the new experience. Still there was the feeling of not being completely at peace and fulfilled. I was asked to return to Scotland and, by November 2010, was working in a Port Glasgow parish. Again, it was a blessed and wonderful experience. Yet I still felt a yearning for a different way of life. In June 2011 circumstances brought me to London. I wanted to celebrate the feast of St Francis on 4 October in a Franciscan setting and the monastery of the Poor Clares in Arkley was suggested. Here I received a very warm welcome and it was during this time that new life and a new energy began to grow within me. I knew I had to come back to this place; my life had changed and I had found the peace, joy and fulfilment I had always been longing for. 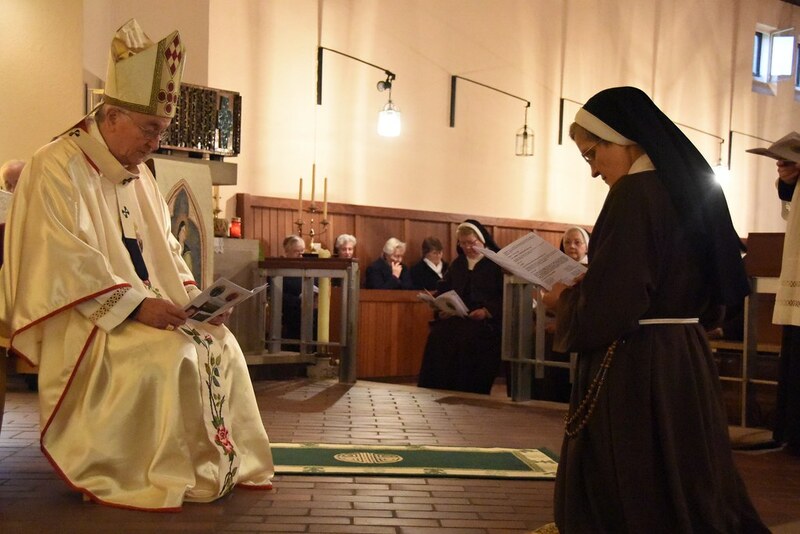 I entered the Poor Clares on 31 January 2012, and, after a period of discernment and readjustment, made my Solemn Vows as a Poor Clare on 1 February 2015.